The sign goes up each summer, just as it has for more than half a century. Fastened to the front porch railing, it signals the house is ready for family to drop by. The Brustman House is one of the few rooming houses active in Sharon Springs. It’s been a long while since there have been actual guests other than family. So, in effect, the House serves as a summer retreat and hang-out for the extended Brustman family and their friends. back in the day guests automatically qualified as family friends, which even in the family is considered a dubious honor. It helped if prospective roomers liked kids, had a sense of humor, and weren’t fussy over rudimentary accommodations. This is not your ordinary guest house. It is impossibly declasse with virtually no conventional charm whatever. And little unconventional charm either. Architecturally it is an agglomeration of add-ons, given just enough maintenance to keep it standing and functional, albeit barely. Everything is slightly askew, and its principal structural strength is derived from a century and a half of accumulated wall paperings. Internal decor is similarly funky, with furnishings drawn principally from hotel discards or K-Mart. There is nothing to commend the house except its place in the collective Brustman family heart. For a hundred years this was a private home. Then, during World War II Louis and Dora Brustman, on and off visitors to the village, purchased the property and turned it into a rooming house. Like themselves, their clientele were Yiddish speaking East-Europeans seeking respite from hot summers in the hectic immigrant neighborhoods of NYC. The Brustman House was their livelihood for many years. Their children and grandchildren always helped out. 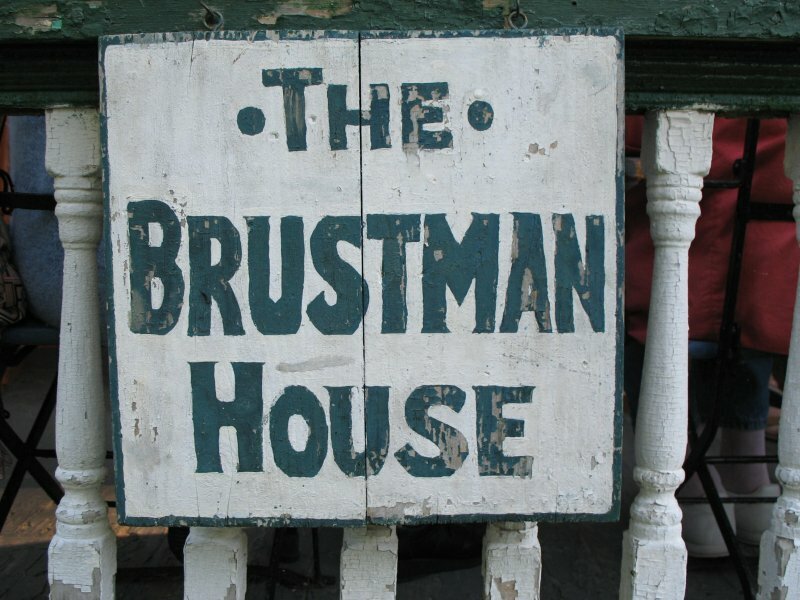 Over the decades, as the original clientele died out and business dwindled, the House increasingly became a meeting place for several generations of Brustmans, now spread across North America. They love the house and its unpretentious and patchy qualities. Dora and Louis’s grandchildren preside over the house hosting a constant stream of visitors, mostly their children, cousins, nieces, nephews, grandchildren and family friends. The house is on a treed plot of land, abutting a small wood. 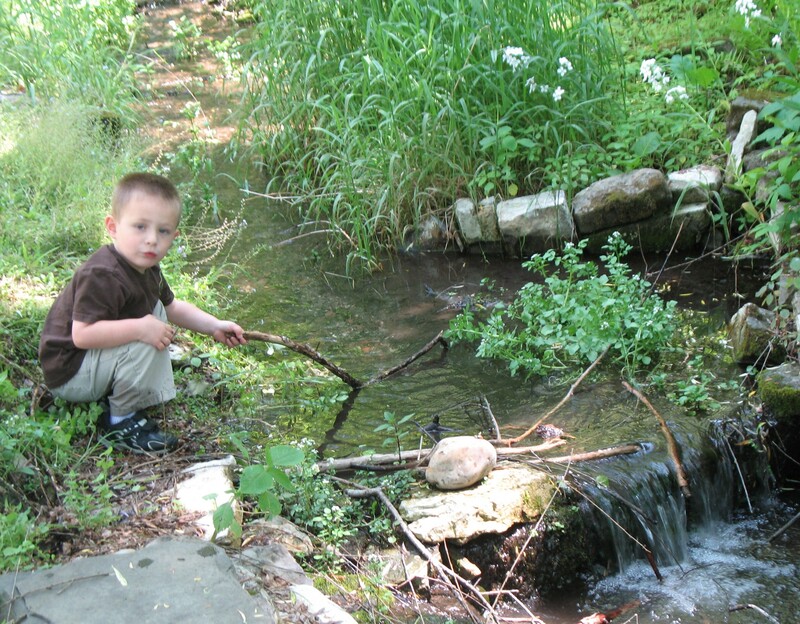 A brook tumbles through the back yard, providing the little kids a constant source of joy and chasing frogs. The house has two porches with exercise equipment in the form of rocking chairs. The location, on Union Street, is a block from the Roseboro and American Hotels and close to the other village sights. The Brustman House isn’t for everyone. It’s for the blithely undiscriminating who expect no redeeming value save a cheap rate. It’s for those who saw the movie “Psycho” and thought the Bates motel was nice, but too upscale. It’s for those who’ve had it with phony elegance and are ready for genuine decrepitude. You get the picture. 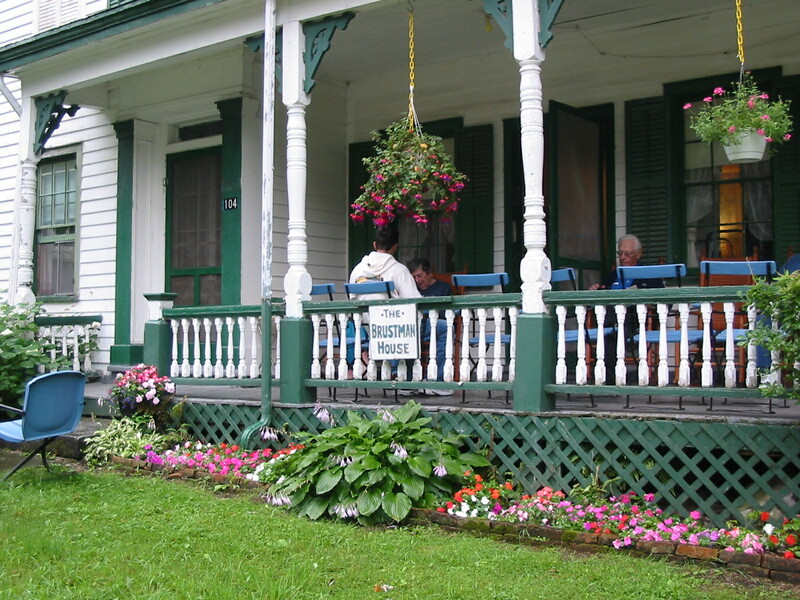 The Brustman House is open each year to welcome family through the summer. Each year, usually in early August, the House hosts a family reunion. Four generations of Brustmans come from all over to enjoy each others’ company, take in the Village ambience, and marvel that the House still stands.